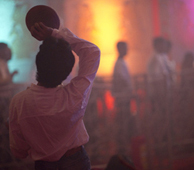 I first experienced this dance through one of the most beautiful Hindi films of this decade – Parineeta. 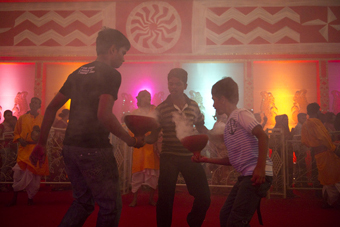 This dance is performed at the Durga Puja – a hindu festival that has its roots in Bengal. 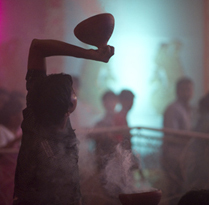 So here I am in Bombay again, having planned my travel to coincide with durga puja, so that I would not only experience the dance’s energy and beauty, but also capture it into pixels. 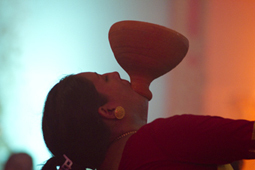 Tomorrow the dances start – so this evening I went across and established contact with some organisers of the event – it would be a pity if I were to miss the entire performance because of arrangement errors or permission glitches! 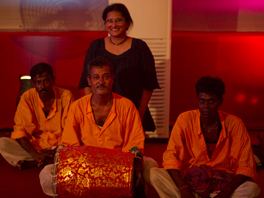 One of the organisers also invited me to participate and dance in the dhunuchi…an idea that I find very appealing! 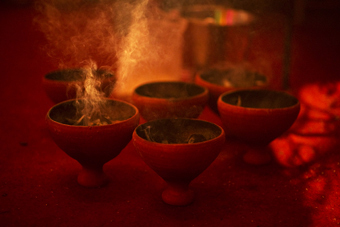 Traditions such as these, are all around me, and it is hard to believe that it has taken so many years of life, for me to sit up and take notice! Have just come back from the first evening! An absolutely exhilarating time! 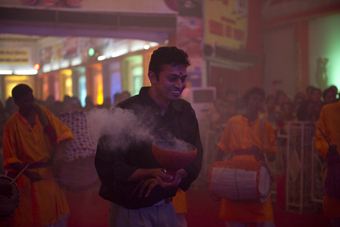 Drums, dance, coals, dhoop, a beautiful deity and wonderful people who were strangers when I reached there, but friends by the time I left! 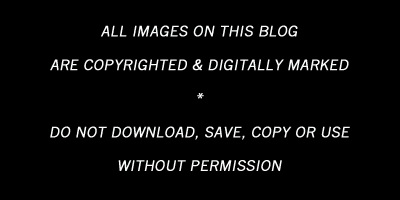 Last week on my photo forum I read someone complain about unfriendly people in Bombay …and I found that totally contrary to my experience. 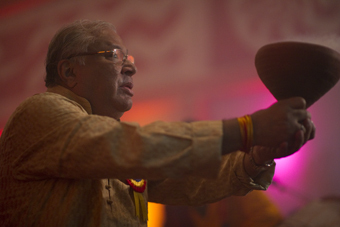 Every single time I step out into this city, I feel it envelop me and include me completely into itself – seamlessly and effortlessly I am absorbed into any sub community as a visitor that they are delighted to welcome! I get absorbed into their lives like a drop gets absorbed into the ocean. 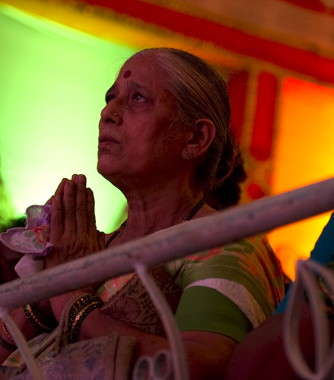 The people of Bombay are the most amazingly inclusive people anywhere! And I love it to death! 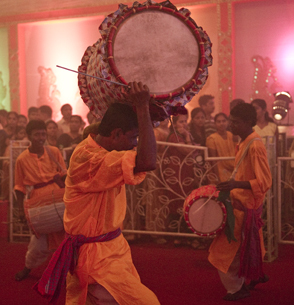 The people I bonded with at the Durga Puja included 4 people from the organising committee – 3 men and 1 woman, the security guards, and the drum beaters. 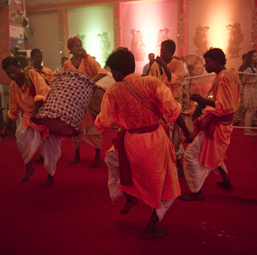 Each one of them – including the security guard, danced the dhunuchi dance, with a little more abandon specially for my camera. It was an honor bestowed upon me by so many …all strangers. 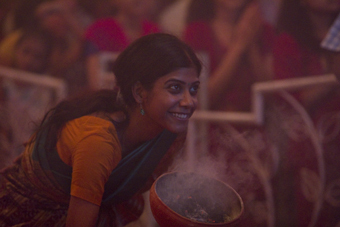 I succumbed to the irresistible beat too and danced a bit….with the coal pots in my hands! Maybe folk dances have some magic potion in them that draw people into the rhythm and compel them to dance. 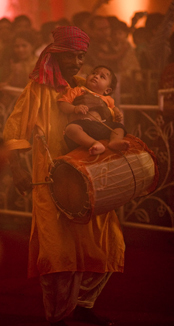 Tomorrow is the more important day of the 10 day festival – more drums, more dancers, more color, and more preparedness on my part – for photography and for dancing! 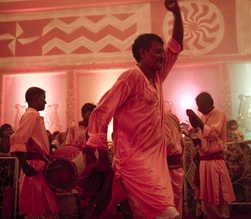 The dhunuchi dance is a devotional folk dance, and is inclusive…it does not divide people into performers and watchers. 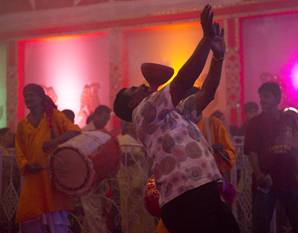 Anyone may begin dancing as it is simply one more way of worshipping Durga. 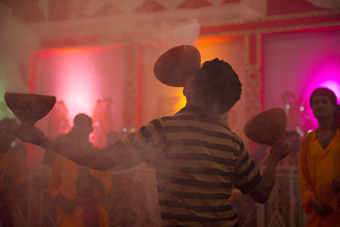 The photos that follow show men and women, young people and old, novices and experts all dancing the dhunuchi with equal fervour. 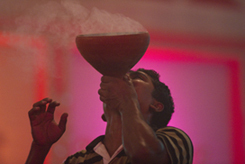 In the dance, individuals pick up clay pots that are shaped like large wine glasses and are filled with burning coconut coir shells or coals, in their bare hands and dance in front of the deity, to the beat of large resounding drums beats. 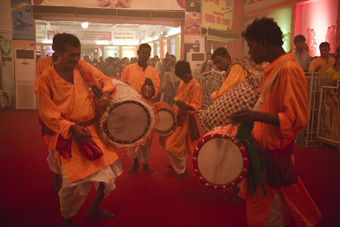 The drummers use a variety of drums and metal plates to create a beat and rhythm that is unique to Bengal. 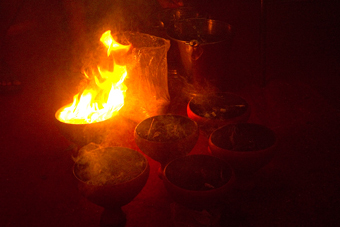 The evening begins with the ‘arti’ and then the holy arti fire is used to light the coals in the dhunuchi pots. 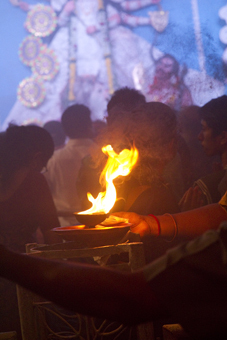 Individuals take turns at this dance and sway and move around the staging area, facing the goddess, moving their burning hands in graceful movements. 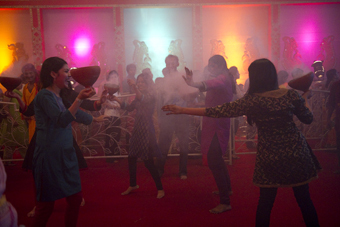 Smoke and sound and movement fill the air creating an immersive trance-like atmosphere in which devotees dance. 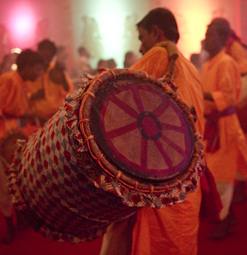 The drummers lead the dancers with their beats – sometimes slow, sometimes fast…and together they form around as a single united being. 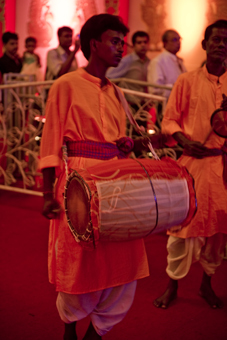 A photo-profile of the men whose beats awaken latent desires to dance .. 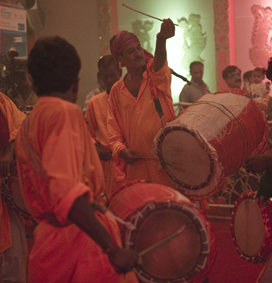 The drum beaters, have been specially imported from a village in Bengal and belong to a community and sub-caste whose inherited profession is drum beating. 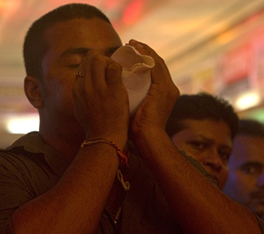 They speak only Bengali, but with match enthusiasm on both sides, it is not impossible to communicate with them with only fragments of language. 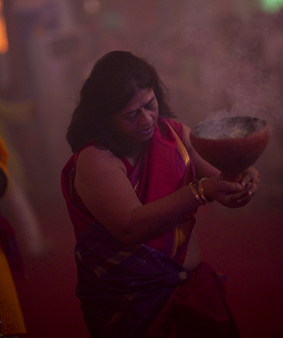 This fabulous folk festival lasts 10 days and ends with the immersion of the idol on the 10th day. Every year it has been organised in the same spot about 6km from my home since I was a child…but it is only this year that I noticed the dhunuchi dance!! The depth of my ignorance startles me and keeps me laughing at myself! This entry was posted on October 13, 2010 by wovensouls in Culture Kaleidoscope and tagged art, art photography, Asia, bengal, Bombay, cultural, cultural photography, dance, dhunuchi, Dhunuchi Dance, Durga, Durga Puja, ethnic, festival, folk dance, hindu, Hinduism, india, Indian festival, jaina mishra, lifestyle, Mumbai, Parineeta, photo essay, photographer, Photography, religion, Religion & Spirituality, Religious, ritual, Shivaji Park, textile art, tradition, travel, travelogue, worship, wovensouls.